how I learned to pay for shipping and love it. In a world where "free shipping" is the make or break of an online sale, as both a buyer and seller, I encourage you to think twice before falling for free shipping. Nothing, nothing, is ever free. There is always a cost; it might be hidden in advertising, it might be added into the price tag, or there might be flat rate shipping - but no matter what, someone along the line is usually eating the extra cost, whether it's you or the retailer. And let's not ignore the obvious, many stores entice customers to buy more with "free shipping" on orders of $$$ or more"! It's the age old cheap trick of if you buy more, you save more. Shipping costs exist despite the prevalence of "free shipping". If you are a large retailer and ship frequently you are eligible for discounts through UPS and FedEx, but there will always be a shipping cost. (Shipping is actually frequently called Logistics - neat, huh?) For rennes, unless it is a very large parcel, I always ship USPS because it is still the more affordable, and the average turn around time, 2-3 days for Priority is pretty good, and UPS ground takes a week to get from Boston to California. There are three main things that factor in to raw shipping cost : 1. Packaging costs (box, tissue paper, post cards, etc.) 2. Postage (dependent on destination, weight, and size if over-sized) and 3. Labor to package. (This might seem like little work, but try packaging up 20 boxes in one go, you'll be surprised how long it takes! This is why when most companies grow to a certain point they hire distribution centers). So let's say I'm mailing a bag from Boston to San Francisco and box weighs 4 lbs. My Box costs $2.50, tissue paper, booklets, postcards, envelopes are $.70 - so that's $3.20. Postage costs $16.28, includes delivery confirmation, but not signature confirmation, if I want that it's usually and extra $2 - which I do want because I don't want a valuable package left on porch. I also want insurance against loss or damage, so that's another $8, making the grand total $29.48 pre labor. And no one who is buying an item which is shipping domestically will ever pay $29.48, even if that's how much it costs. When I ship within the North-east, usually my total will come to between $11-16 for a bag with the same specs. So what do you do if the customer is unlikely to pay the face value of the shipping cost? The first and most straightforward option is to embed that extra cost in the price tag. Just mark your product price up by 5% and offer free shipping and most customers will be thrilled. However, if you are carrying a product that already has an MSRP, chances are you can't mark it up by much or you will loose the sale as your customer shops around. Or maybe the wholesaler has already taken this into account and that's why they recommend a 2.5X mark up instead of a 2.3X. In either case, the retailer can potentially add that cost in to the price. Lots of people do this on ebay to help cover the ebay fees, which is mainly why prices are so inflated there. Another way (and much more devious) to compensate for loss in shipping is through advertising. I have adblock installed on all our computer devices, but once in a while I'll open an incognito tab and be astounded by how many ads are there! And low and behold, google knows that I've been surfing on Need Supply or looking at a certain jacket on a certain website, and there it is, in my face, luring me in and making me want it. Sure, I didn't pay cash to see this ad, but cash is essentially time and my time is being used up by looking at and wanting to purchase said jacket - or maybe I will even go and purchase the jacket eventually. While I'm sure shipping is only one of the cost of goods sold that gets provided for by advertising, I think it's important to remember, if you're not paying for shipping, chances are you are paying in another way. The last and probably most frequented option by small businesses is to make a flat rate shipping option which finds the median for average shipping costs. Still, that median is usually over what people are willing to pay for shipping, and most shops end up charging between $10-12, and the store eats the rest of the cost. This doesn't have a huge effect for higher priced orders, but for lower priced items that tend to be heavy, there can be much more of a profit loss. “I almost always add something to my basket if it means getting free shipping,” says Jim Hassee, 60 years old, of Greenwood, Ind. To qualify for free shipping, he recently bought more than $45 of coffee from Keurig.com even though he needed only a single box." 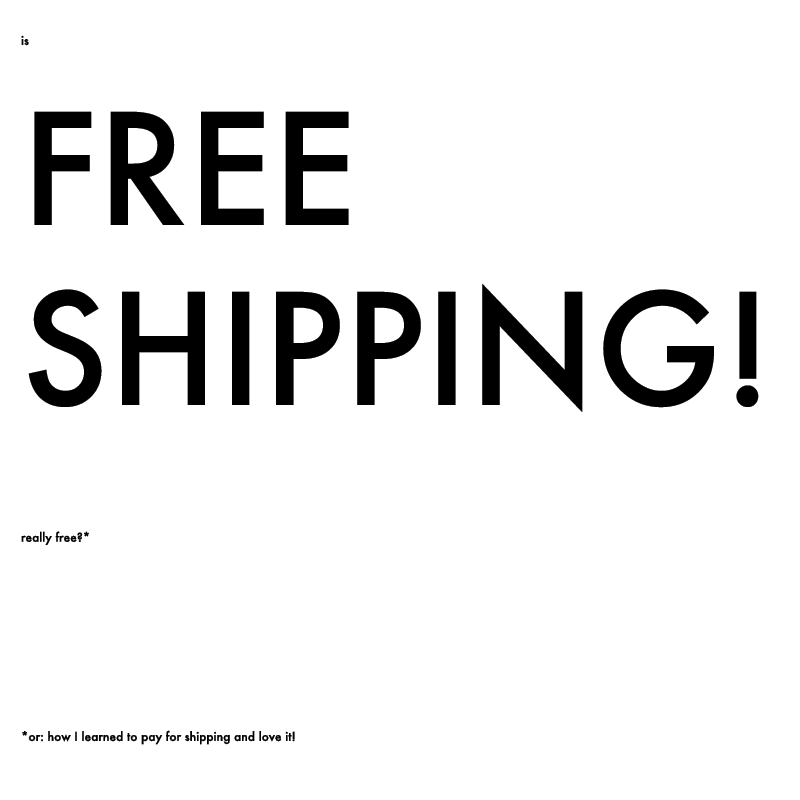 As a buyer, I've also come to expect free shipping. I feel if I am paying a considerable amount of money for something, I deserve free shipping. But I really don't deserve it. If I really wanted free shipping, I should drive to the store and buy it rather than expecting someone to go out and get it for me for free. Having something shipped to you is a service and it should be paid for, and that payment should be considered separate from the item cost.